We’re rolling out the new user registration/Editor-at-Large user management plugin (developed by one of our managing editors, Amanda Regan) this week. This post will serve as an introduction to its new features, and a brief instruction manual for both new users and existing Editors-at-Large. We welcome any feedback you might have after you’ve experienced this new process—our goal is to make the registration process easier, and to enable current editors to be more involved in DHNow. This post will have separate sections for current editors and new editors, so just jump down to whichever section applies to you. If you are a new editor, you will need to use our new registration form to request a user login and to schedule your time as Editor at Large. 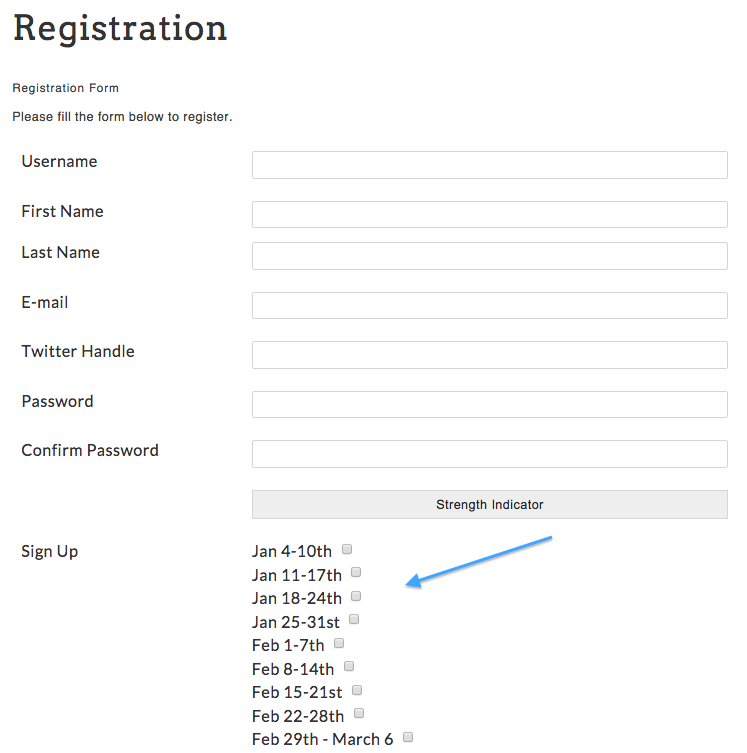 Existing users will need to log in to their user accounts on digitalhumanitiesnow.org to add or edit volunteer weeks. 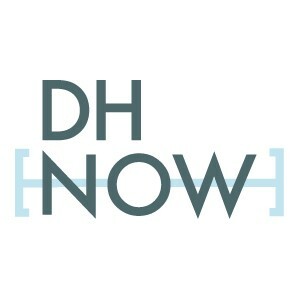 Please note that there will no longer be a separate schedule page in the Editors-at-Large corner on DHNow. If you need to check your dates, you can log in at any time to access your user profile and view or edit your schedule. You can also add dates at any point during the semester using the same interface. We encourage all new users to read through the Editors’ Corner of DHNow to learn about the role of our Editors-at-Large, and to get an introduction to using the PressForward plugin to nominate content. Once you’ve decided to become an Editor-at-Large, visit the digitalhumantiesnow.org homepage and scroll down below the slider to locate the “Volunteer” button. Click “sign up” to access the registration form. Your username, first and last name, email address, and password are required fields. You have the option to add your Twitter username, your institutional affiliation, and a brief biography. Your name, institution, and bio will appear on any Editor’s choice piece published during your week. You can opt out by checking “No” in the “Display Profile” field. If you opt out any information you choose to enter will not be displayed publicly. Select the weeks you would like to be an Editor-at-Large for the semester. These dates can be edited at any time from your user profile. Once you have submitted the form, you will receive an acknowledgement email. Our site manager will approve your submission within 2-3 business days. Once approved, you will receive a second email verifying your username and password and giving you access to DHNow. After you have been approved as an editor and have your login information, you can login and edit your user profile at any time. Keep reading to find out what you can do as an Editor-at-Large. If you have an existing WordPress account, we consider you a current Editor-at-Large. You may not notice as many front-end changes to the process, but we hope that these updates will allow you to have more control over your role as Editor-at-Large. The changes to our system will not affect how you use the PressForward plugin to nominate content. If you have any questions about the changes procedures listed below, please let us know. If you are an existing user of our WordPress site, you should already have a username and password and be able to access your user profile. If you are not logged in, you can login by visiting digitalhumanitiesnow.org/wp-admin and entering your credentials, or navigate to the homepage and click “Log In” under “Editors-at-Large” below the slider. the “Nominate Content” button should be immediately visible. Clicking this link will take you directly to the “All Content” page of the PressForward plugin. the “Manage Volunteer Dates” button should be visible under “Volunteer” on the homepage. This button will take you to your user profile. Once you have logged in, you can now edit your profile and update your volunteer dates from within the WordPress dashboard. 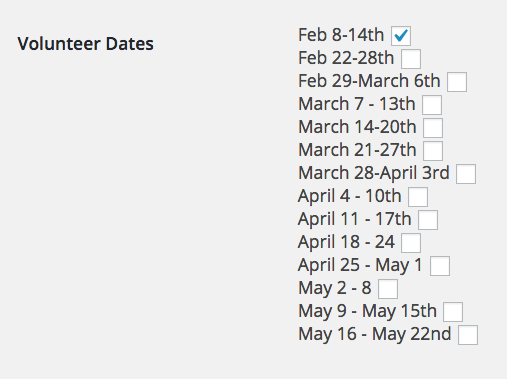 The “Manage Volunteer Dates” button will take you to your user profile or you can select “Your Profile” from the WordPress menu. From within your user profile, you can edit your email address, add a Twitter username, or add an institutional affiliation to keep your information up-to-date. You can also choose to opt-out of displaying your information publicly on Editor’s Choice pieces during the weeks you are signed up as an Editor-at-Large. You can toggle this display at any time by logging in and editing the Display Profile setting. Your user profile also now contains the dates you are scheduled to be an Editor-at-Large. If you would like to add weeks to your schedule, just use the checkboxes next to your chosen dates to do so. If you cannot be an editor for a selected week, just uncheck that week to remove yourself from the schedule. We have also removed the schedule page in favor of a personalized user profile. 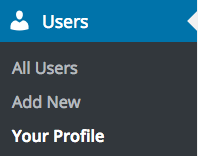 Since there will no longer be a generic schedule page in the Editors’ Corner, you will need to check inside your user profile to see when you have signed up to be an editor. By shifting control over scheduling, editors have more options for choosing dates, and can add and edit this information at will. Be sure to save your selections by clicking the “Update Profile” button before logging out. We hope that these changes will improve the experience and engagement level of our Editors-at-Large, and encourage you to give us feedback on these new procedures so that we can make this process as open and effective as possible. Thank you for your patience and for volunteering at DHNow! This content was selected for Digital Humanities Now by Editor-in-Chief Amanda Regan based on nominations by Editors-at-Large: Francesca Bussey, Joseph Garvin, Michelle Hoogterp, Nickoal Eichmann-Kalwara.